Chef Javier recently had the pleasure of catering a special friend’s birthday at her home for 30 VIP guests. Check out the menu below made just for her don’t miss the photos of the food and her and her husbands beautiful home! One filled with mushrooms, bell peppers, fresh herbs, sofrito and jack cheese (V) and the second with home-made chorizo and jack cheese. Thinly sliced and grilled to medium perfection. Tossed with a balsamic reduction and crispy pork belly. Previous PostDo you eat Spanglish?Next PostA star is born! Thank-YOU for making such a spectacular birthday dinner. 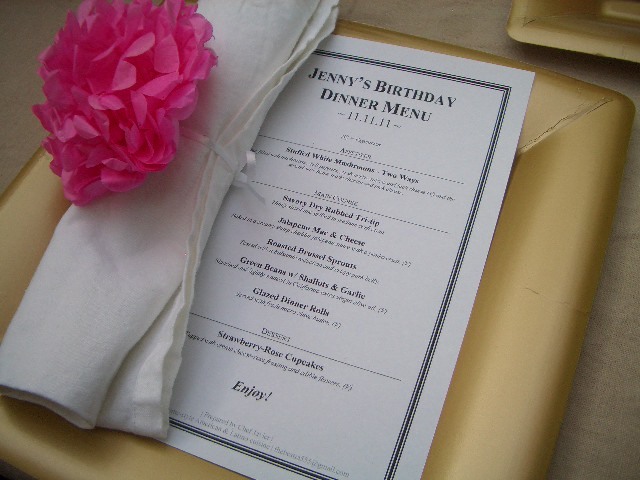 You managed to please a crowd of 30 while exceeding the expectations of a selective”foody” birthday girl. The menu was so “me”. I think we will have dreams about the jalapeno mac & cheese. You came very organized with a plan in action and left my kitchen cleaner than the way you found it. We made the perfect choice when we asked you to be the chef of our dinner party!